EAT THEM! Some people have never heard of eating pumpkin seeds, but they are very rich in protein as well as minerals phosphorus, magnesium, and manganese, and a good source of the minerals zinc, iron, and copper! Yes, you can eat them and they are very good for you! Check out this yummy recipe to do with your pumpkin seeds! 1 cup fresh pumpkin seeds, cleaned and dried. Place your seeds on a baking pan in the over for about 5 minutes at 350 degrees then remove. Use a frying pan and add about 3 tablespoons of sugar. Stir often and wait for sugar to caramelize. Once sugar is caramelized remove from burner. Mix caramelized sugar and baked seeds together then pour onto parchment paper and let cool. Add some salt and wa la! Break apart and eat! Enjoy your seeds! If you still have little ones celebrating Halloween this is a great holiday craft with little skill required and turns out cute as ever! little kid hands and feet! Start by simply painting each canvas. Next paint on your spiderweb and polka dots. Then you’ll want to scoop your kiddie and dip them in paint. Add their prints. Add your word of choice, Eek and Boo went well with a spider and ghost, but you can add your word of choice. Finally you have made a super cute custom Halloween decoration that also serves an a great way to remember baby hands and toes! The highly anticipated zombie favorite returns to AMC. The opening night last Sunday left a idea on what twist this season had in store for us. If you recall “Violet” not feeling well, The Walking Dead just added a spoiler on their Facebook page. So what do you think this means? 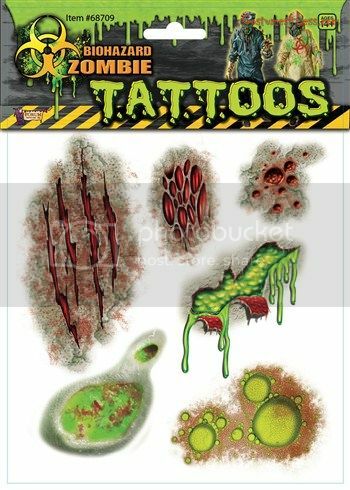 Is it a true spoiler or do we think there zombies are now capable of infecting animals? Let your kiddies dress up as Rick Grimes! And maybe you can be Violet! Check a few of the costumes we offer below to make this adorable duo possible. You need to take a second to enter our first awesome giveaway of the season!!! “Make Our Own Network” solely organized this event and I received no compensation for this publication. My opinions are 100% my own and may differ from your own or even those stated in this post. YOUR BLOG NAME HERE is not responsible for sponsor prize shipment. Get excited for a chance to win 1 of 8 Gift Certificates to get your costume EARLY!!! Bloggers can sign up to participate in the giveaway event! Reach in to the fun bag! New Clip from Iron Man 3 is out! Oh boy the date for the release of Iron Man 3 just keeps getting closer! We cannot wait, and I bet you were just dying to see the new Iron Man 3 costume as well! Here you go… enjoy! Get Ready For The Zombie Apocalypse…Blend In With Costume. If you are a “The Walking Dead” fan then you are probably just as obsessed as I am with Zombies. I don’t what it is, I’ve always had this inclining that zombies interesting, but then the old comic, “The Walking Dead” became the awesome show on AMC, and now we are all obsessed. If you watch the show you know that many times the living has gotten a way around the dead by dousing themselves in walkers blood. Yuck- but if it saves me…I’m doing it. I am thinking a similar approach but by using a costume. That’s right blend in with costume now, then should the time arrise don’t hesitate to douse yourself in the walkers stench. 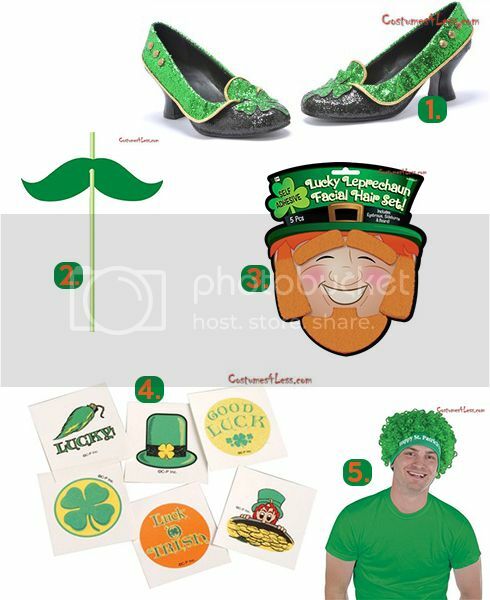 5 St. Patrick’s Day Accessories You Have To Have! Woo hoo one of our favorite holidays is right around the corner: St. Patrick’s Day! So now I have brought you some of the most awesome accessories that you just HAVE to have in order to have the most amazing St. Patty’s day possible. 1. HellO Irish! These awesome irish adult shoes feature a 2.5 inch heel, a black rounded sparkly toe and green sides with gold trim and buttons and a green clover on the front. 2. Grab a pack of these fun straws, 6 straws are included in each pack. These silly straws have a green moustache so that when you are drinking through it you appear to have a St. Patty’s day fun face! 3. OH yeahhh the luck of the Irish is usually red (orangish) hair! So go ahead and get in the spirit and use these self-adhesive eyebrows, sideburns, and beard! Oh yea that’s right it’s almost time for Dr. Seuss’ birthday! In case you didn’t know, Dr. Seuss did so much awesomeness for children learning to read that there is now a whole day for him right on his birthday- Read Across America. If you have kids, then you probably know that this upcoming week is a school celbration for Dr. Seuss and reading. So…have a party! Every party needs decorations, and I tend to go a bit overboard when it comes to decorations! I actually ordered gifts for my daughter AND party decorations all in the same place from Costumes4Less.com Yes, Costumes 4 Less also has party supplies and gifts! 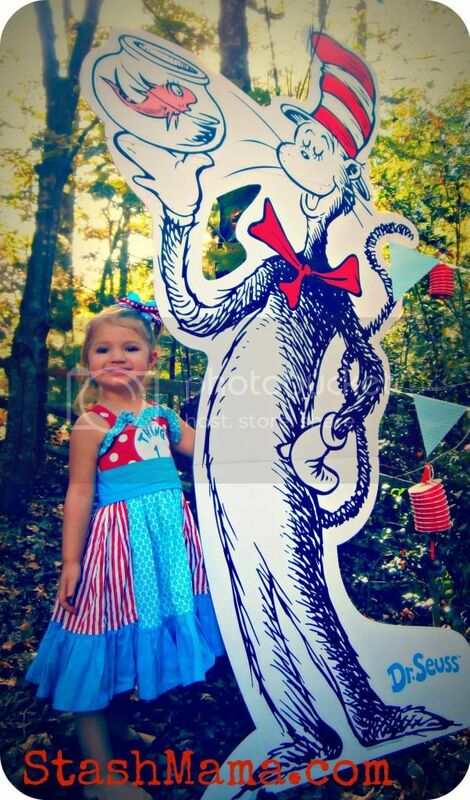 -Cat in the Hat cardboard cut-out stand up. I know there was a bunch more that I ordered along with that! Anyways, a couple of the things I ordered I modified to make more “catty” decorations. These were bought decorations with extra special time put into them giving the party more of a diy feel. I especially order the red champagne flutes because when I was a kid I always loved pretending to drink out of the fancy cups. Well these flues were fancy with a twist! I painted white lines on all of the flutes so that they would resemble Cat in the Hat’s hat. Then I took the red paper lantern garland and when it arrived it’s folded together, so when you open it up, it pops out to become a lantern. Well I keep this unopened and then just painted the rims of it with my white. I then popped it open and hung to dry, but this created a cute mod mini Cat in the the Hat’s hat decorations! Let me just say everyone loved them! Sometimes you just have to think outside the box, for easy ways to decorate, get crafty and have a partay! The tableware was perfect, the party pack I bought came with a bunch of things, balloons, streamers, string, plates, napkins, forks, spoons, tablecloth. It was the perfect colors too, the simple red and Bermuda blue. My husband argued with me that it could be any blue and red and I had to correct him and tell him, no it has to be Bermuda Blue. I was right! I just loved the way the tables turned out. 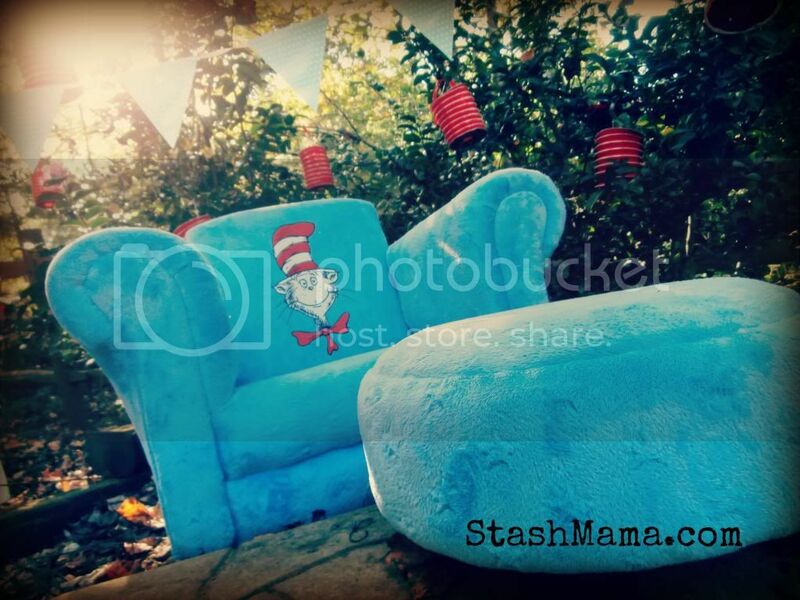 I also ordered this gorgeous blue velour Cat in the Hat chair and stool. 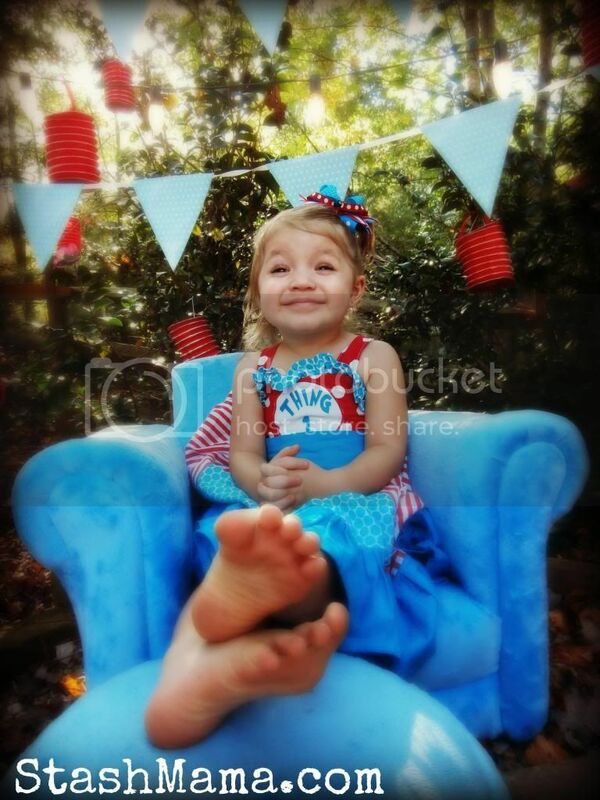 Omg, I just love this chair, it’s absolutely adorable! My little “Sally” sat in this chair to open her presents, and of course to get her picture taken, but now she just sits in this chair when she’s reading or simply relaxing. This chair was awesome because it doubled as a whimsical decoration as well as a gift for the birthday girl or for read across America week this chair could stand for the person who is reading to the others!